Located right next to JR Shinagawa Shinkansen Station, The Strings by InterContinental Tokyo offers spacious accommodation with panoramic skyline views, personalised staff attention and a 24-hour fitness centre. Free Wi-Fi is provided throughout the property. 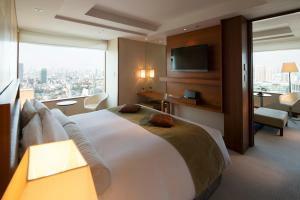 Rooms at The Strings showcase tasteful Japanese design, with large windows that offer skyline views. Each room has a seating area and a flat-screen satellite TV. The adjacent JR Shinagawa Train Station offers access to Shinkansen bullet trains to Osaka. Local trains on the Yamanote Line run directly to the Shibuya and Shinjuku areas in about 20 minutes. Guests can take an Airport Limousine Bus directly from Narita International Airport, which is a 90-minute ride away. 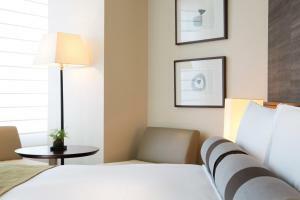 Guests can unwind with in-room aromatherapy and reflexology, or work at the 24-hour business centre. China Shadow Restaurant serves authentic Chinese dishes with 26th-floor views. The elegant Dining Room offers international fusion fare. Room service is available 24 hours. Restaurant & Bar The Dining Room lunch and tea time will be closed. Chinese Restaurant CHINA SHADOW lunch and dinner time will be closed. Please contact the hotel for more information. Located on the 27th - 30th floors, this very spacious room with panoramic city views features a wooden floor and a seating area with a TV and a sofa. It's also fitted with a safe and a small fridge. Special toiletries and other Premier-class perks are available. Located on the 27th - 30th floors, this spacious room with a 3 metre-high ceiling and great city views features a wooden floor and a seating area with a TV and a sofa. It's also fitted with a safe and a small fridge. 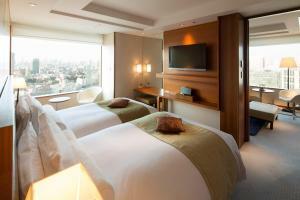 Rate: ¥ 27200.00 ... ¥ 87500.00; select dates below to get current rates. Guests can request to stay in Double or Twin room, but cannot be guaranteed (subject to availability). Air-conditioned room featuring a wooden floor, a TV and a seating area with a sofa. It's also fitted with a safe and a small fridge. Please also be informed that bed types will be subject to availability, and cannot be guaranteed. 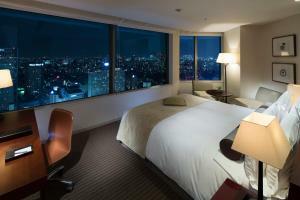 Rate: ¥ 28066.70 ... ¥ 77666.70; select dates below to get current rates. Guests can request to stay in Double or Twin room, but cannot be guaranteed (subject to availability). Located on the 27th - 30th floors, this very spacious room with panoramic city views features a wooden floor, a seating area with a TV and a sofa. It's also fitted with a safe and a small fridge. 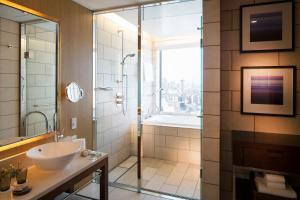 Special toiletries and other Premier-class perks are available. Please also be informed that bed types will be subject to availability, and cannot be guaranteed. Spacious room with a wooden floor and a seating area with a TV and a sofa. It's also fitted with a safe and a small fridge. Includes complimentary access to the fitness centre. 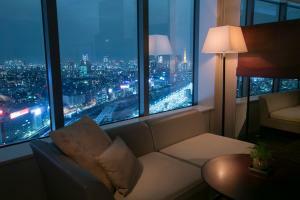 Located on the 30th floor with a panoramic city view. This luxurious suite comes with all modern facilities including a flat-screen satellite TV, as well as a spa bath. Includes a complimentary access to the fitness centre. 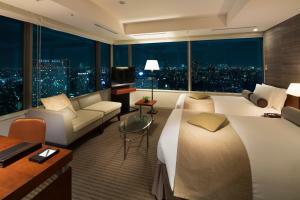 Rate: ¥ 24700.00 ... ¥ 100000.00; select dates below to get current rates.